The Night Owl is 2! Desperados are bringing legendary lost UK club nights back to life across the summer of 2017 – giving them a new home in a massive house party series across the UK. The second Desperados Club house event will take place on Wednesday the 28th of June right here at The Night Owl in Birmingham. 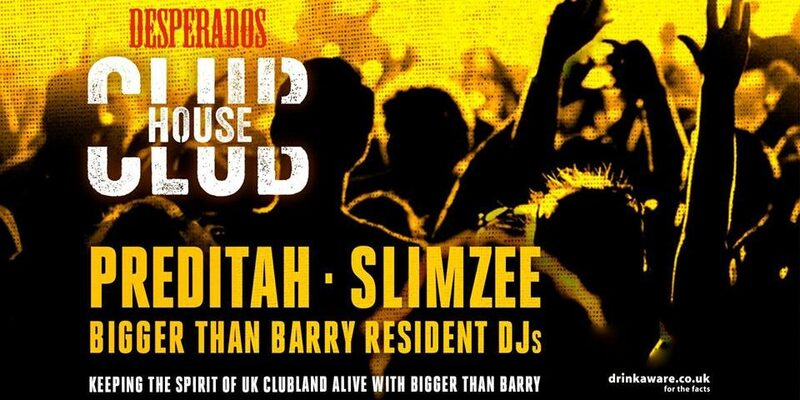 The legendary club night they’re bringing back is the fat man himself, grime and dubstep night Bigger Than Barry and the line up will feature Preditah, Slimzee & Bigger Than Barry Resident DJs. Acts that have performed at Bigger Than Barry include A-Trak, Diplo, Major Lazer, Fake Blood, Annie Mac, Benga and many more. Here’s a bit about the history of the night from organisers Sam Baylis and Kieran McInerney (made for the 10 Years of The Rainbow celebration), along with Desperados’ Art of Party film from the London Tour show. The Clubhouse will also be appearing at three major UK festivals – Parklife, Boomtown and Bestival – and going on tour to London, Birmingham and Glasgow across the summer. Please register on the guest list: http://bit.ly/2sDyP1C; each registered guest may bring along a plus one. On the day, make sure you get there early as entry will be permitted on a first come first serve basis!